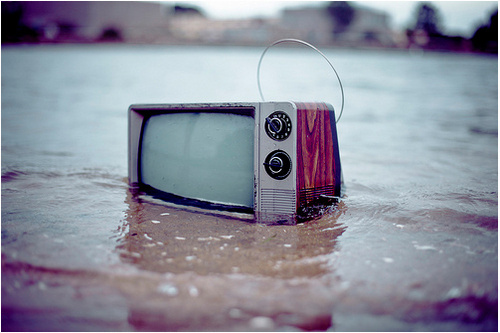 Grow up Media: Shocking video of a flood-victim! What will happen to you if you lose your house due to a flood? Surely you will feel as if you have lost a part of yourself and there is no future. What will be your reaction when someone asks you at that time, ”How are you feeling after losing your house?, Are you missing your belonging?” and their sole purpose will be to capture your emotions, they might even play a sad song to show your emotions. Most of us would get enraged due to the immature and childish questions from such people, obviously this is no drama but a real disaster! Such type of reporting is common in the sub-continent where the ratings of a TV Channel are more important than anything else. They don’t care whether you are smiling, crying or even dying , for them emotion means rating. Flood-victims are not for sitting! Few weeks back, a video was circulating over the web that showed an Indian reporter covering the recent floods in Uttarakhand. The video shows that the person is sitting over the shoulders of a flood-victim while shouting out loud that the government is no where to be seen and these people are left at the mercy of the floods. The flood-victim who was carrying ‘this’ person was standing in the floodwaters while reporter kept yelling at the government. 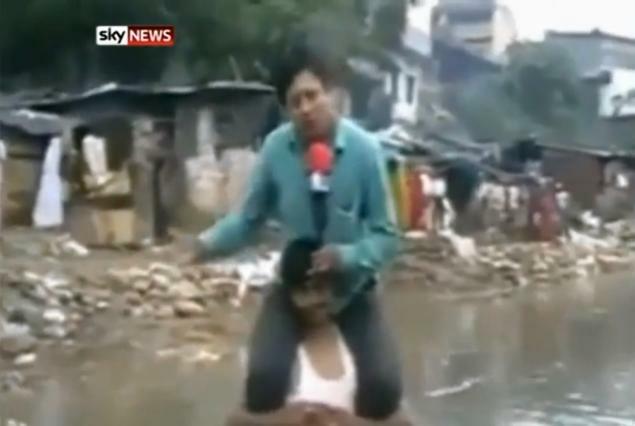 Why did the reporter sit on the shoulders of the poor flood-victim? because he didn’t want his legs to get wet! Though on the other hand, the reporter said that the flood-victim offered him this ‘gesture’ so that the reporter can cross the floodwaters since he was the first person of ‘his level’ to come. The reporter has even lashed out at the cameraman as he showed the full footage. There are no words to describe this inhuman act of this person. The good news is that India’s News Channel has ‘terminated’ his contract but we all have seen the unethical reporting in the time of disaster so this wont be a last time such things come from the media of Sub-continent. You might have already viewed this video, the shocking incident occurred some weeks back. Reporter was criticized by the world-media for his ‘inhuman’ behavior. Oh my! Indian media is reputted to cross limits quite often and making sad news very dramatic just like Geo News, but this is totally outrageous! Geo News mostly copies Indian Media therefore this trend has started in Pakistan. Rain has just started in Lahore (7:50am 12 July). Great weather. Dark clouds with cool breeze. Stunning right now! He has studied but his inhuman nature still remains. Well, his literacy is questionable. Plus, it won’t teach you to be humane. That comes from the inside only! Well you are taught manners in schools.They rub the gold inside you so you can sparkle as a diamond.But he remained a git. When will you post the new article? 12july to further days you’ll post ? M talkinh about that. And how much mm it rained in hyd today? I will make that article in coming week. About Hyderabad rain, well PMD will post the quantity tomorrow morning.